Many studies have shown the presence of diverse and active microbial communities in a variety of deep subsurface environments and their importance in biogeochemical cycles and degrading organic contaminants. In work supported by the U.S. Department of Energy's Subsurface Science Program and Natural and Accelerated Bioremediation Research (NABIR) Program, PNNL scientists and collaborators investigated the microbial community in >90 million-year-old sedimentary rocks 200 meters below ground surface in northwestern New Mexico using DNA- and RNA-based molecular analyses. They placed a multilevel sampler in a borehole at the site to collect adequate microbial biomass for characterization. The study and their results appeared in the January 2006 issue of Environmental Microbiology. The purpose of the study was to investigate microbial community diversity at the shale-sandstone interface, and assess whether sulfate-reducing bacteria (SRB) are the predominant type of microbe at this location. Sedimentary rocks, many of which are comprised of pore sizes that highly restrict microbial movement, are particularly intriguing because the microbes potentially represent remnants of ancient microbial communities associated with the original deposits. The research team found indications of a homogeneously distributed bacterial community across the shale-sandstone interface. Delta-Proteobacteria sequences were common at all depths, and were dominated by members of the Geobacteraceae family that are often capable of dissimilatory Fe(III) and/or elemental sulfur (Sº) reduction, but not sulfate reduction. RNA hybridization data also suggested that Fe(III)-/Sº-reducing bacteria were predominant. These findings are striking considering the lack of significant concentrations of these electron acceptors in this environment and suggest that the bacteria are using other, not-yet-defined metabolic processes to survive. Sequences of SRB, fermenters, denitrifiers, and acetogens were also recovered. Researchers are interested in the ability of microbial communities to reduce iron, sulfur, and sulfate, as this has potential for remediating subsurface contamination by changing the transport properties of the contaminants. Methanogenic Archaea, a type of microbial life distinct from the bacteria, was also present in the community. The shale and sandstone contained different families of methanogenic Archaea with different capabilities for using low molecular weight carbon compounds. The presence of a phylogenetically and functionally diverse microbial community in this deep subsurface environment likely reflects the complex nature of the primary energy and carbon sources, the kerogen associated with the shale. 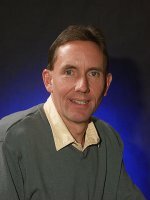 Jim Fredrickson, Fred Brockman, and Jim McKinley are the PNNL authors, with co-authors Ken Takai, Japan Marine Science and Technology Center and Melanie Mormile, University of Missouri-Rolla (both worked on the project while at PNNL), and William Kovacik and William Holben, University of Montana. The circular white screen in each unit of the multi-level sampler (inset) allows water and bacteria to enter. 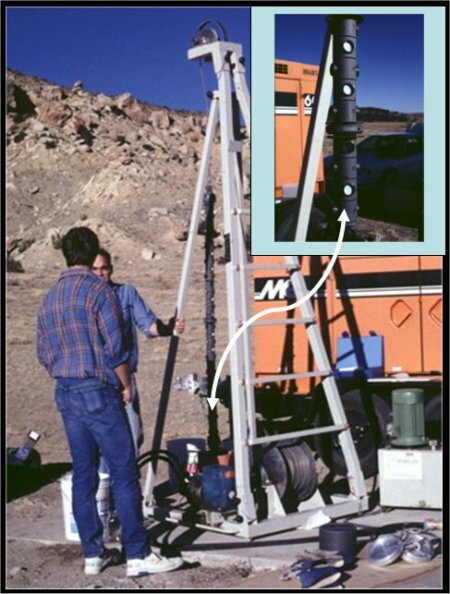 The multi-level sampler is lowered to a specific depth in the borehole, and each unit equilibrates with any local differences in rock-water geochemistry and associated microbial communities. After removal of the multi-level sampler, detailed analyses are conducted on samples from each unit. Kovacik WP, Jr, K Takai, MR Mormile, JP McKinley, FJ Brockman, JK Fredrickson, and WE Holben. 2006. "Molecular analysis of deep subsurface Cretaceous rock indicates abundant Fe(III)- and Sº-reducing bacteria in a sulfate-rich environment." Environmental Microbiology 8(1):141-155.